Hanging Banners are offered in a wide selection of sizes, materials and styles, making it simple to find a solution that broadcasts your brand and messaging in any environment. 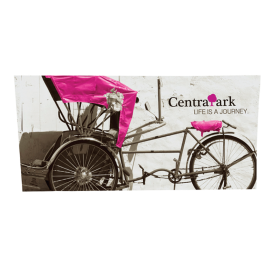 Hanging Banners are available in a variety of indoor and outdoor materials, in a wide range of sizes and with your choice of five finishing options. Easily create the perfect advertisement for retail, outdoor and indoor environments. Formulate© Hanging Structures elevate your brand and messaging, attract attention and draw the eye. Available in a wide selection of shapes and sizes, and three collections including Essential (economy), Master (mid-range) and Designer Series (premium), it is easy to find the perfect hanging sign for your trade show exhibit, commercial or retail space. Indoor Hanging Banners are offered in a wide range of custom size options, ranging from minimum 2ft wide/high to 10ft wide/high. Banners are printed on state-of-the-art graphic equipment using high-quality processes. Available in several materials, including Vinyl and indoor fabric, it is simple to create a custom hanging banner that fits your advertising needs. Choose from several finishing options to complete your indoor hanging banner and ensure versatility and functionality in any environment. Indoor hanging banners are high quality and include a one year limited graphic warranty. Hanging banners are perfect for use to advertise sales, promote a brand, or bring awareness to a business and can be used at trade shows, in retail settings and more! Outdoor Hanging Banners are versatile and weather resistant, making them ideal for outdoor advertising and messaging needs. Banners are offered in a wide range of custom size options, from minimum 2ft wide/high to maximum 10ft wide/high and are printed using state-of-the-art graphic equipment and print processes. Choose from several finishing options and outdoor materials to create a customized outdoor hanging banner that is a quality solution for any environment. Outdoor hanging banners include a six-month limited graphic warranty and are perfect for use to advertise sales, outdoor events, sports teams and more!